I went to my quilt group today. They are a pretty awesome group of gals. 2 half yards of your choice. But these are what I'm petting today. I want this as lining in a bag. I'm on a red kick. and show us what you make. What do I want to make out of it? I had a white swatch as a teenager that I loved. Currently, I have a pink one. needs to hang from my porch this summer. I keep meaning to show you. out of Sweet As Honey, yes, I am. Loving this Witch Hazel fabric. 2 half yards of normal fabric. leave a comment about what fabric you'd pick. 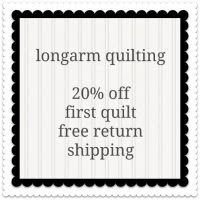 Take a peek in the shop. I'd love a piece of British Invation. It has stuck in my mind! Today is a holiday in South Africa, I am still in my PJ's - it's 8:00! OK I really love the old Polaroid print and the swatches - cute little bags with these. I love the watch fabric and the honey line has been talking to me. That fabric of the Polaroids reminds me; did you know that children born in the 2000's don't know what the song line "Shake it like a Polaroid picture." means? I'd love to have the Essential Dots in turquoise and Lipstick Red. Thanks for the chance. Maybe some metro living and some of the geekly chic glasses! Well, as a Swiss Girl, I just love the Swatch!!! Had quite a few, I loved them! I love Witch Hazel and would love a half yard of the two prints you have in the shop. I'd pick some Sweet as Honey since my son is a beekeeper. 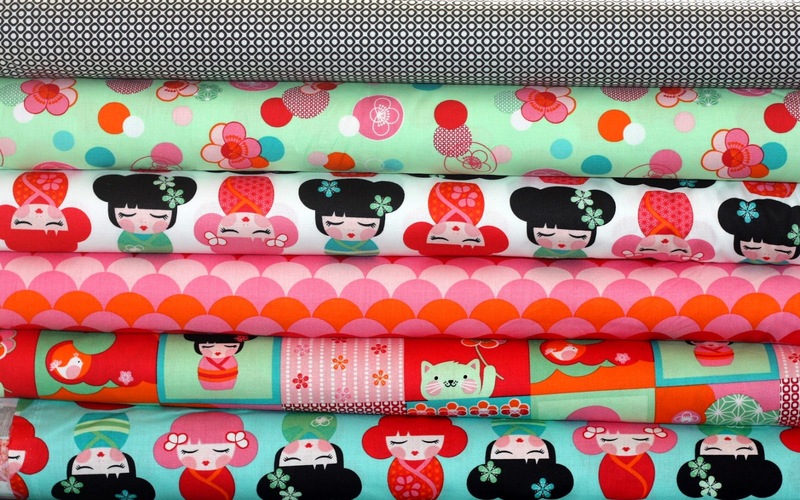 I think I would choose some I am Ninja fabric! I like the multi ruler fabric. And, maybe I'd choose on of the Kona solids that you carry. I love the Hello Tokyo collection, and I also love Sweet and Honey, I'd choose some of them. Thanks! I would go with Sweet as Honey...if I am lucky!! Thanks gals!! I love the banner fabric and also anything from the Sweet as Honey collection. 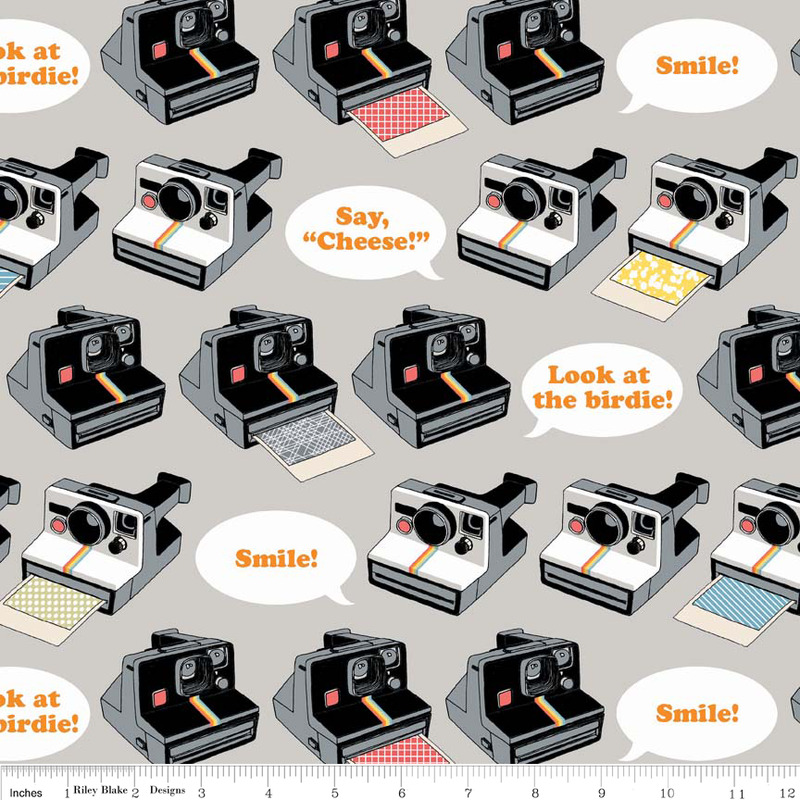 OH, and the camera fabric is too cute! Metro Living Marigold Yellow from Robert Kaufman and BIRDS from Scooters in Paris brown fabric by Timeless Treasures are a couple that I like. Thanks for the chance to win! Half Moon Modern fabric Aqua Ovals and High Street Yellow Moda Fabric by Lily Ashbury speak to me. I would like to pet them! Soooo many cute fabrics. I love the Geekly Chic line, especially the Cameras and Glasses. Thanks so much! Probably the aqua and red essentials dots. Thanks for the chance! It would have to be the Swatch. or the Polaroid. No, no, definitely the Swatch!! How very nice! Sweet As Honey - Orchard Blossom Spring Blue & Sweet As Honey - Honey House Peach Beehive. Pff, way too hard to pick... Even though I adore the Ghastlie Violets, I think I'd go with "Dena Designs Tea Garden Darjeeling Free Spirit" and "High Street Yellow Moda Fabric by Lily Ashbury". On my screen it seems like they'd be a great match for a fun, summery project (Bag!). They are all lovely, but I think I would like Sweet As Honey! Love the Witch Hazel. That would be my pick. Have fun with your hexagons. I too have hexagon fever. I love the polaroid cameras - brings back lots of memories. I would pick that one, and Witch Hazel. Thanks for the chance to win! I LOVE!!! Ghastlie fabric so that would have to be on the top of my list. Also the Girl Friend fabric is really cute. Too many great fabrics really, really hard to decide but thanks for the chance to look and dream. Hard choice - I'm looking for the 'Home Ec' Fabric by Michael Miller - I've seen it, otherwise I love the Sweet as Honey Line. I love Fabric giveaways - thanks for a chance to win. HAHA I love the I Am Ninja fabric - it would make a great superhero cape for a little guy - instant invisibility! Apples Momo, Yellow Owls, Apple Faces....love them all, need to stop shopping and get some work done! thanks for the fun!! Oh def the Halloween !! Love the Sweet As Honey material...almost as much as I love seeing a new blog post from you two! Polaroid Camera and the Eiffel Tower. I could see them both made up into zipper purses. What fun. Never make a fabricoholic choose - I want them all!!! If I must pick - I would go with Hello Tokoyo as I do not have any of that kind of fabric in my huge (according to my husband!) stash. I have to go with Sweet as Honey. Thanks for the chance. Hi, my favourite are the Hello Tokyo Pink Scallop and the Dessert Party Ice Cream Sundaes Pink. I really want that Witch Hazel fabric, it's so cute! Thanks for the chance to win. They have a lot of beautiful fabric. I would choose A Ghastly Holiday and McKensie Black Swirl. Thanks! Tough choice! I really would like some of the Geeky Chic fabric and I need to beef up my stash of yellows and purples. Thanks for the chance! I really like the ruler fabric, think it would be fun to use in projects and as a border for a sewing themed quilt. It's up in the air between Hello Tokyo and Geekly Chic!! What a generous giveaway! I'd love to win some PotLuck Multi Ruler MeasuringTape and Metro Living Marigold Yellow. Thanks! That Swatch is fabulous!! What fun choices! 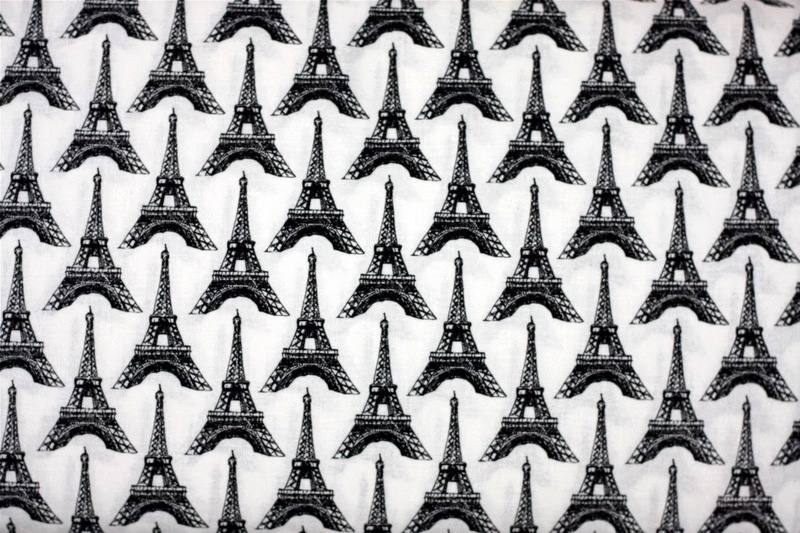 I love those Eiffel Towers! I want to make a skirt out of it. Thanks for the giveaway. You have such cute choices! I really like the camera fabrics! I would take the precious little deer in the Sweet As Honey line! I am loving the Girl Superhero fabric. I think it would be a toss up between the Zombie fabric and the new Witch Hazel for this year's Halloween quilt. Thanks for the chance at the great giveaway! HI, I'd select 'White Deer Hideaway '! I know I felt bad that I didn't get to talk to you. I have Pearl here, so had to rush home to get back to her. Yummy lunch, huh, esp. the dessert! Did you notice the quilt of Nancy's under the cutting board? I need some of that brown! I love that quilt, do you, let's make it together!? what do you think? What minty do you carry? Thanks! I like happy home and I am Ninja! i have serious crush on that Ghastlie family! I'm saving up for a quilt FOR ME! I LOVE the Blue Feathers, Don't Let the Pigeon Drive the Bus!! Even the name is awesome! Oh and btw the pouch pattern arrived and I can't wait to make them (need to find some plastic first). Thank you! I make charity quilts for a kids' chemo unit so I keep an eye out for fun bright kid-themed fabrics. I'd choose Toybox Blue w/Marbles and White Girl Friends Princess. What unusual fabrics. I like the ghastly collection. Um, there's so many! The princesses, or the ballerinas, or the hello Tokyo girls. And the I am ninja text. I have a thing for bee skeps so Sweet as Honey would be my choice. Thanks! Oooohhhh, to pick out just the fabrics that appeal to me!! I love many of the ones you shared with us today. 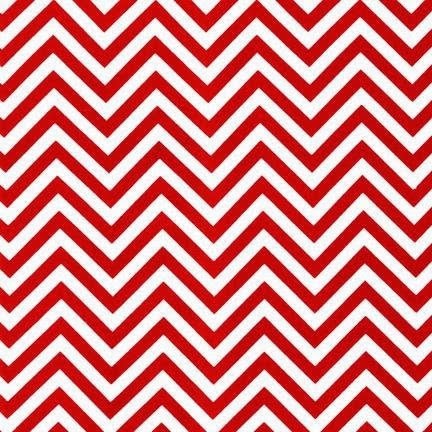 That Witch Hazel was wonderful, the bunting in the R,W,B, and the R & G were adorable, Red Chevron was stunning, and the camera fabric made me think of my daughter who is a photographer. Thanks for a fab giveaway and the chance to win! I'd pick some red chevron and McKenzie black swirl. What a nice little shop, I love some of her selections. I would love to have some Witch Hazel I love the black and white print, so awesome. Thanks for the giveaway! Oh man tough choice but I would have to say potluck rulers multi I just love these I can't get enough and the zombie fabric too fun! 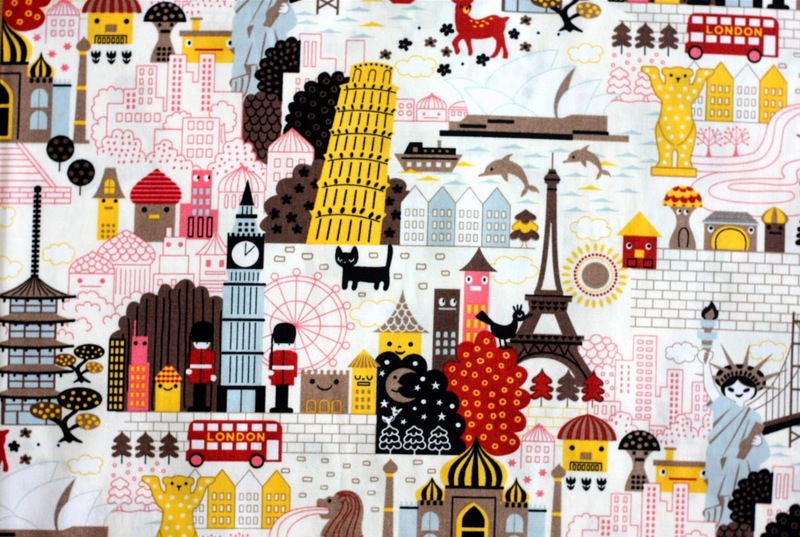 I just finished a quilt with the geekly chic fabric so I think I'd pick some tokyo. love the colors! Pepe in Paris Eiffel Tower and Fox and the Houndstooth have both caught my eye (I'm thinking they would work great for some bag ideas I have ;o). Tea Garden caught my eye, as did lots of others. oh my... 75 hexagons done? I for sure need to catch up .. I love Sweet as Honey - the sunny hives and deer - too lovely! 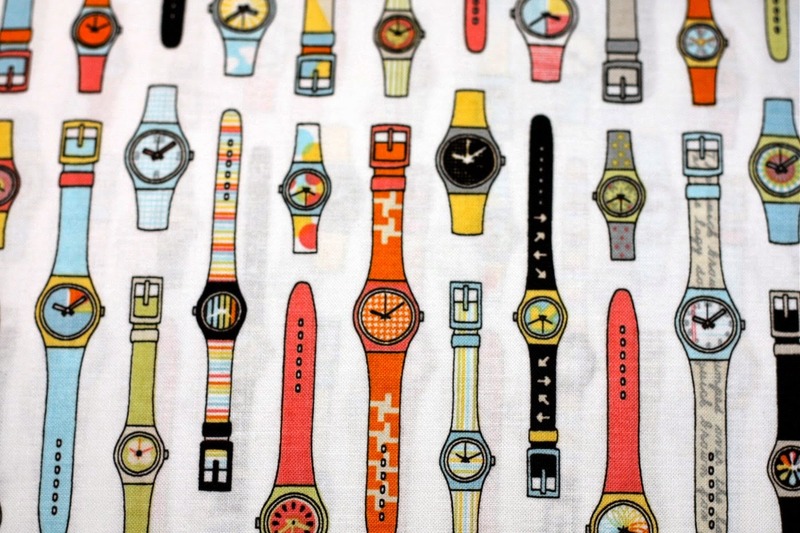 That Swatch is cool too - I had a Swatch watch back in the day... lime green. thanks! Oh wowzers! That a Witch Hazel is just so cool...I love vintage looking fabric! 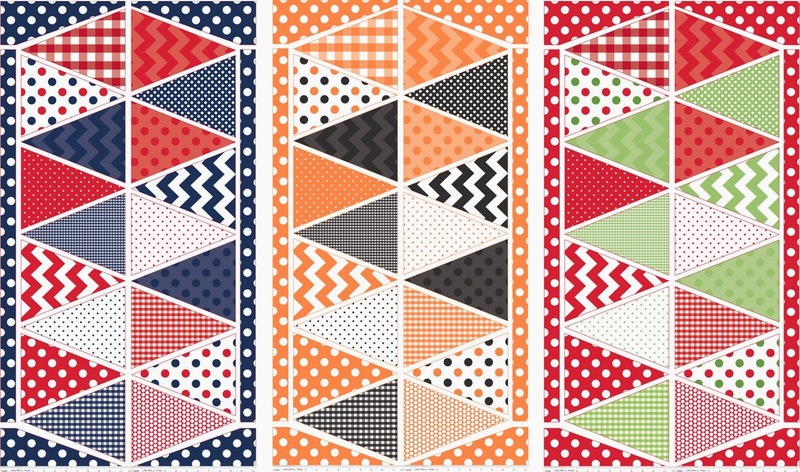 My daughter is having a baby in Oct, I would like the bunting fabric. My favorite is Sweet As Honey - Orchard Blossom Spring Blue and my daughter LOVES Hello Tokyo soft panel. I'm so bummed - I missed quilt group again! Next month, now that the law student is finally finished with school! Oh, and fabric? I'm thinking the cameras and the glasses on the lavender background. But the Eiffel towers are awesome too. I would pick the bunting! Sew cute! Thanks for the chance to win. I would get Hello Tokyo in Green. Hard to only pick one! I adore the Girl Friends Mermaids fabric. How adorable! I would pick the top two sweet as honey prints that you have pictured above. I would pick the Metro Living Marigold Yellow from Robert Kaufman and the Shrimp fabric from Bento Box. Something fun and something serious. I'd get the super kids girl and ... oh, this is hard!..... Girl Friends Princess or those neat ruler fabric! Tough choice, but I think I'd choose the girlfriend princesses and either the ballerinas or fairies to make more "dolls" for my granddaughters. I made the super girls and now the 4 yr old wants the super boys so her girls will have friends! They are so fun to make and the girls love to play with them. Sweet As Honey - Orchard Blossom Spring Blue - Art Gallery Fabric and Grey Sasparilla Flannel Cowboy & Cowgirl from Riley Blake..I love those horses! I love the Girlfriend's Mermaid (perfect, since my pregnant sister is doing a mermaid themed nursery), and the Wee Woodland Scene fabric! This is a difficult choice, but I love the turquoise dot fabric and the Potluck Multi Ruler Measuring tape fabric. Thank you for the giveaway. I love the 12 " potluck ruler measuring tape moda and halloween candy fabric chic or treat moda Those two fabrics are awesome. I love the purple Girlfriends fabric and the Pink Super kids print! I would pick some of the Ghastlie Fabrics. I love lots of it, but especially the cute superheroes and the mermaids! Sooooo many wonderful choices!! I would choose Turquoise Aqua Blue Dots (will work with my next project! )..and also choose Freebird Brown & Red Butterfly! I would have to get one of each of the Witch Hazel. OMGosh, just stinkin' great. Thanks Corrie. Sweet as Honey for me please. Sunflower Yellow Beehive and Peach Beehive. I need some fabric for a baby quilt! I'd pick solids-aqua and tomato Kona cotton. The Sweet as Honey fabric is GORGEOUS! Thank you for hosting a give-away! I have recently discovered I have a distinct lack of red fabrics so I think I'd choose Clothworks Toybox Red with Stars and Modal Lipstick Red Essential Dots. Thanks for the chance! 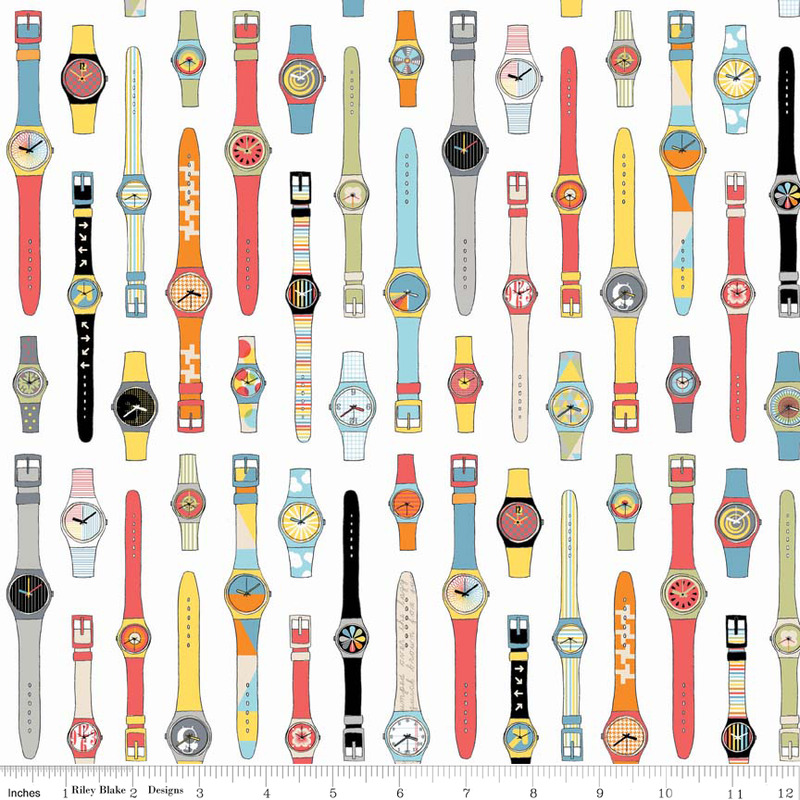 Since my daughter just received a Swatch watch for her 40th birthday, I think the Swatch fabric would come in very handy! So difficult to pick just two! I love all of the geeky chic 2 line, probably the Swatch and cameras. or the tvs. Or the polaroids! Very hard to decide. I think I'll go with the Potluck Ruler in antique and the Girl Friends Fairy. But I couldn't turn down any of them! Ooh I would get me some witch hazel! Love the retro look :) thanks for the giveaway! I am totally taken by the Swatch fabric. It reminds me of my trip to Switzerland in the 80s, where I bought my first Swatch. And my New Years trip to Las Vegas this winter with my husband son, when I bought my most recent one at New York, New York. And all the Swatches in between....of both the timekeeping and fabric sorts! 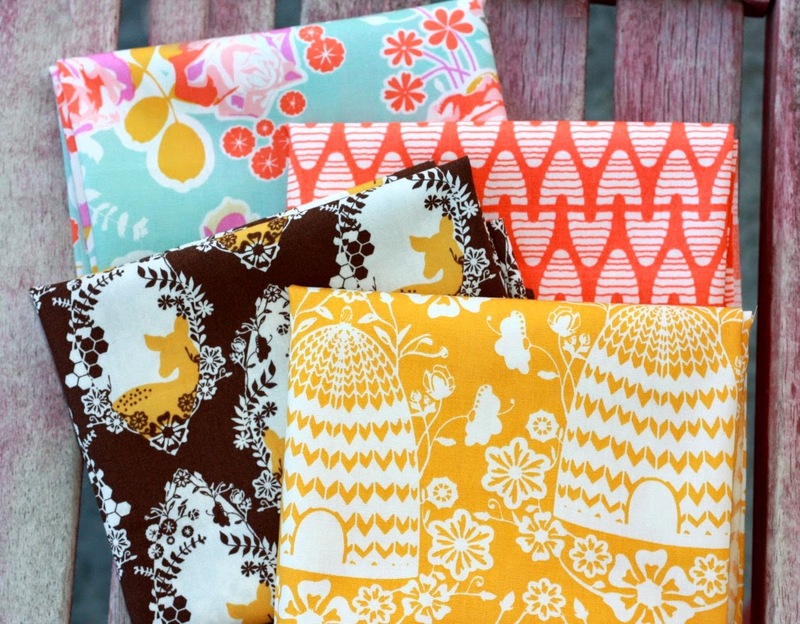 I love that shrimp fabric, I think it would be so fun to make something out of, but I'd have to be sensible and choose the versatile Aqua Kona and the Sweet as Honey Beehives - so cute! Definitely the Witchhazel. I love anything Halloween. Kona Snow. I know, I know, I'm boring, but I always seem to be low on white fabric when I need it. I can always use more whites, so I'd choose 1 yard Kona Snow Cotton solid fabric, Robert Kaufman. I have put this on my list for awhile..I saw a cute craft to make with them.. I had to buy the superhero one for the girls party, Mrs. Texas is coming and I want to impower the girls..
Oh, it's hard to choose! 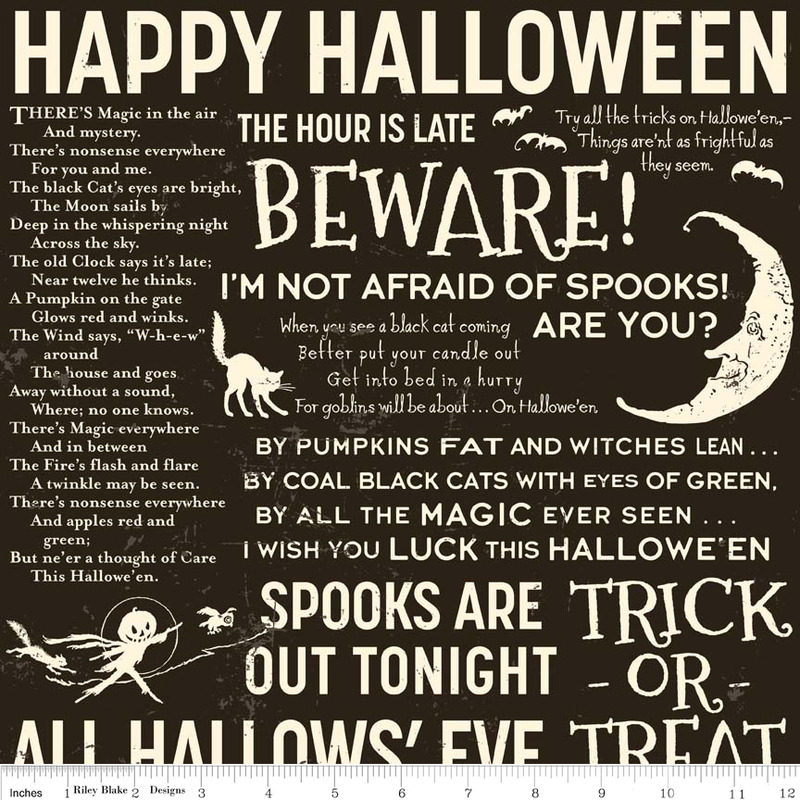 Either the Halloween Candy fabric or Witch Hazel Words. Hello Tokyo pink and green! Perfect for a new little one! Thank you for the opportunity!